Rather than a single print gap, the price action evolved more slowly over 12:30 to 12:40. The spread quickly expanded after 12:30, presumably driven by the jump in volume subsequent to disclosure. 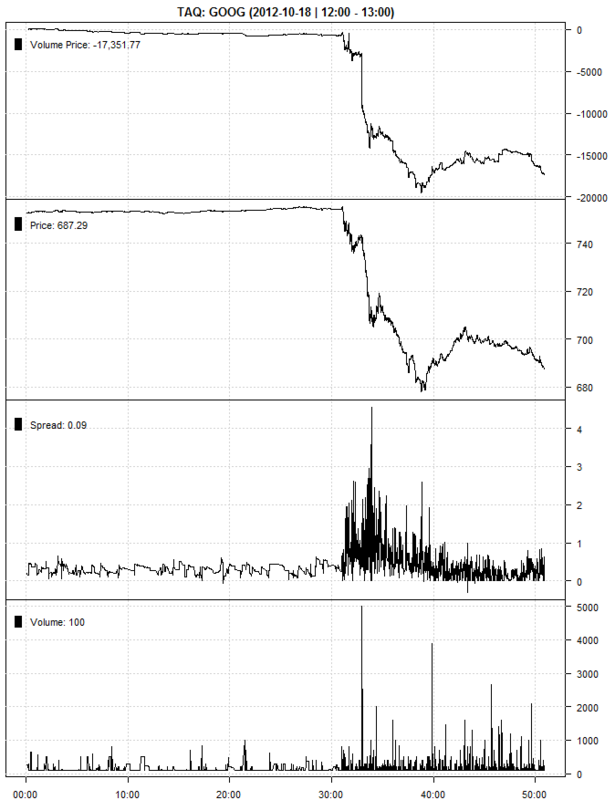 A 5,000 share trade printed shortly after 12:32, as spreads were beginning to stabilize. This precipitated some fear and greed, as market makers blew the spreads out to $4. 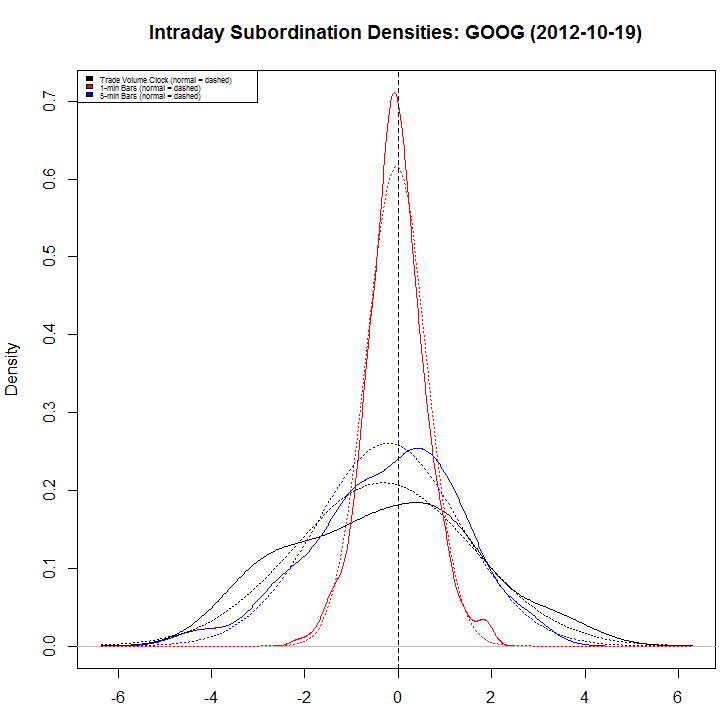 Spread dynamics after noon appear to be fairly typical response to uncertainty and toxicity, as the summary is qualitatively similar to other similar events such as the morning after Bear in 2008. Now that we are familiar with the TAQ action as measured in human chronology, let’s view it through a different lens—following the intuition from Mandelbrot (1963), Clark (1971), and most recently Easley et al. (2012). This reproduces the familiar stylized distribution of high-frequency returns, consistent with Figure 1 from Clark (1971) and Exhibit 2 from Easley et al. (2012). Although certainly leptokurtic, the distributions are not too dissimilar from normal. Now, ignore chronological time and instead consider the trades from the perspective of a clock based on volume of shares traded over the day. In other words, generate a new process defined as the sequence of prices coinciding with shares traded on equal-sized partitions of total volume over the day. 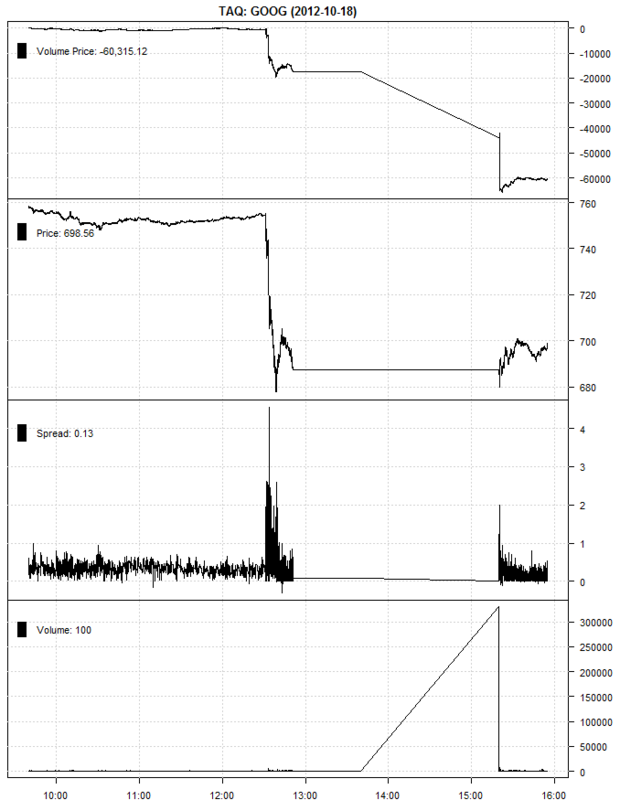 This process generates a “volume clock” for the trades, in doing so exemplifying a beautiful time-series transformation. A similar kernel density can be estimated from this trade volume clock, which is plotted above in black (with dashed corresponding normal fit), assuming partition size of 50. This exhibits distribution characteristics consistent with Exhibit 2 from Easley et al. (2012). 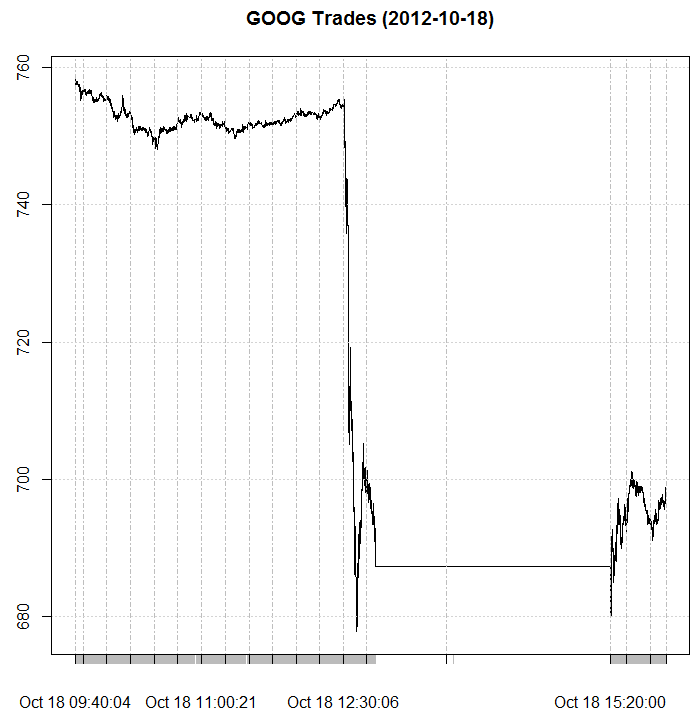 Needless to say, this plot for Oct 18 looks nothing like the previous plot for Oct 19. The normal fits for both 5-min bars (blue) and volume clock (black) are especially interesting, as they have little resemblance to their corresponding kernel estimates. Care is required for trading on days that look like this. For those interested to learn more, see Clark (1971) for theory, including subordinated stochastic processes (originally due to Bochner (1960)). Ané and Geman (2000) apply a bit more sophistication, including arguing in favor of cumulative transaction count rather than cumulative traded volume. Perhaps worth a follow-up post to see if this still makes sense, given current era of predominantly algorithmic program trading. Bochner, Harmonic Analysis and the Theory of Probability , University of California Press, Berkeley, 1960. Mandelbrot, “The Variation of Certain Speculative Prices”, Journal of Business , Vol. 36 (1963), p. 394-419. 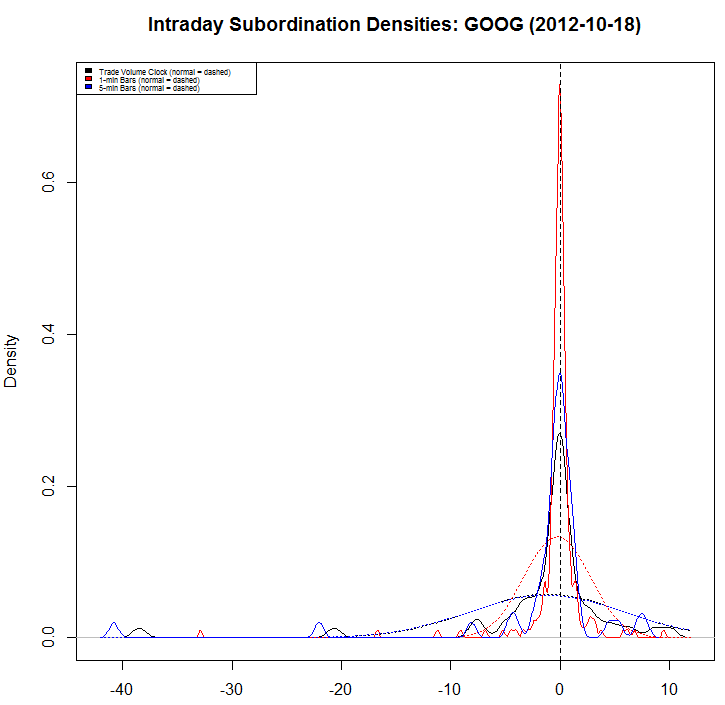 Clark, “A Subordinated Stochastic Process Model with Finite Variance for Speculative Prices”. Center for Economic Research. University of Minnesota, 1971. Ané and Geman, “Order Flow, Transaction Clock, and Normality of Asset Returns”, Journal of Finance , Vol. 55, No. 5 (2000), pp. 2259-2284. Murphy and Izzeldin, “Order Flow, Transaction Clock, and Normality of Asset Returns: Ané and Geman (2000) Revisited”, 2006. Easley, de Prado, and O’Hara, “The Volume Clock: Insights into the High Frequency Paradigm”. Journal of Portfolio Management , May 2012. Nice. Thank you. Which R packages are you using? I was looking at RTAQ and highfrequency but do not see those functions implemented there. @Eduardo: Above functions are from private packages, though built on the usual rfinance packages (e.g. xts). I can post code for the plotting functions, if desired. If possible and not to much hasle for you to share, please. 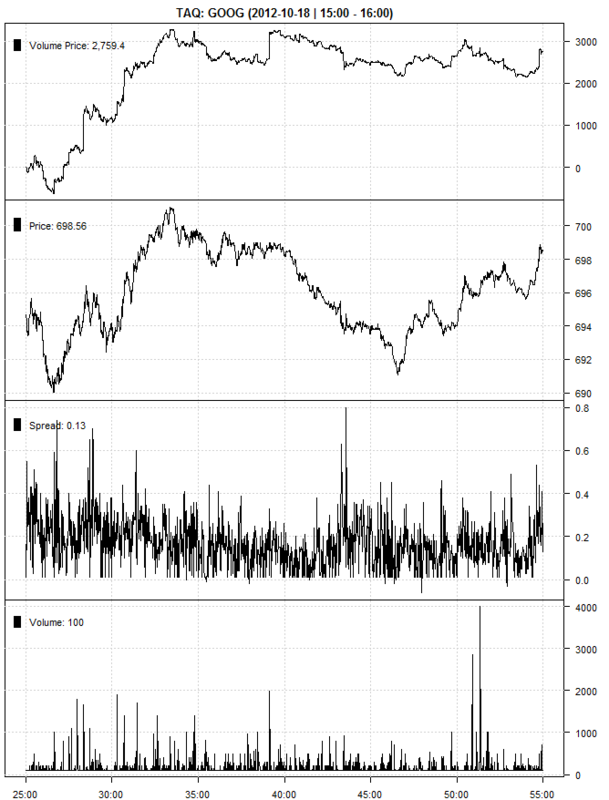 Would like to see how transformation to trade volume clock is done in R.
What exactly is Volume Price? Can you elaborate? @Shoonya: please clarify in what context are you referring, as I did not reference that term in this post? Здравствуйте уважаемее будующие или состоявшиеся родители,спешу поделиться с Вами очень полезной информацией котороя будет полезна при выборе товаров для ваших малышей: интернет магазин помощь маме ребенку не должно быть тесно лежать и, в то же время, слишком большая люлька не создаст нужного комфорта.но в продаже встречаются и модели весом более десяти кг.для холодных регионов такая коляска не подойдет.